I’ve been posting a lot of food deals this week, but hey, what’s one more. 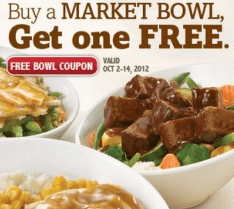 Print this coupon here and bring it to Boston Market to grab a free (new) market bowl when you buy one market bowl with a drink. The market bowls have been going for 6.99, so roughly $10 for a dinner for two at Boston Market. Coupon is valid until October 14, 2012.